I know, lots of Italians are scary- but this time I mean those who are intentionally scary. Namely, the masters of Italian horror films. Italians have a thing for horror- for example, like the French, they are great admirers of Edgar Allan Poe. Celebrate Halloween (which has been "observed" in Italy for about ten years now) by checking out these cult favorites. 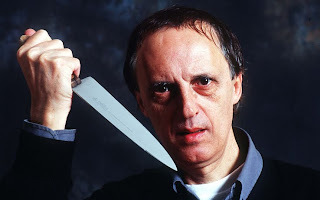 Here are the names of the most famous directors of Italian horror movies: Dario Argento, Riccardo Freda (who once visited my home in Padova with his large dog), Mario Bava, Lamberto Bava (his son), Lucio Fulci, and others. Find out more here. Many of these can be found on Netflix streaming, if you look carefully enough.